Vanpooling is a convenient, cost-effective way to commute for groups of 7 to 15 people who live and work in the same vicinity. Through our contracted vendor, vanpools receive a month-to-month lease on passenger SUVs or vans. The lease includes maintenance, roadside assistance, and insurance costs. 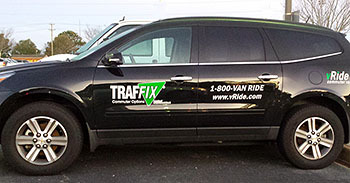 TRAFFIX offers three financial assistance programs for vanpools, such as a monthly stipend, starting a vanpool or saving a vanpool. Pay less in yearly commuting cost. Extend the life of your personal vehicle. Save time by traveling in HOV lanes. Reduce the need for parking spaces. Each vanpool determines its route and schedule based on the needs of the group. Your group also decides convenient drop-off points near your worksite. In most cases, vanpoolers can decide to meet at a Park & Ride lot. Register Your Vanpool Today to Participate in TRAFFIX Programs such as Guaranteed Ride and Financial Assistance (restrictions apply).